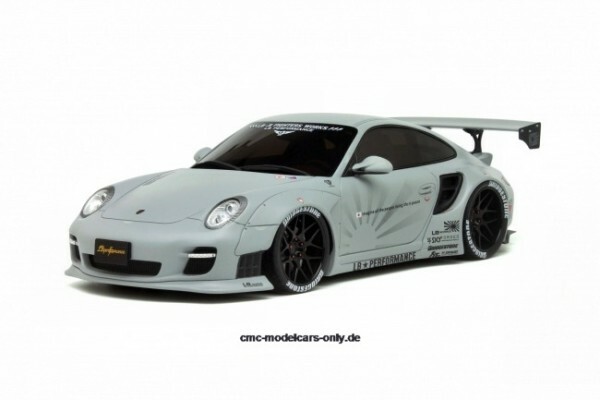 Produktinformationen "1/18 Porsche LB Performance 997 Liberty Walk GT Spirit GT126"
After having dealt with the likes of the 458 Ferrari, the Nissan GT-R and the BMW M3, Liberty Walk decided to take on the Porsche 911 (997). Same formula as before: transform this “simple” sports car into a racing car worthy of the title. Wing extensions are of course part of the process, as well as an impressive – some might even say enormous – rear spoiler. The centrally positioned dual exhaust pipes are a little plus to the racing aspect of this extraordinary 997. Weiterführende Links zu "1/18 Porsche LB Performance 997 Liberty Walk GT Spirit GT126"
Kundenbewertungen für "1/18 Porsche LB Performance 997 Liberty Walk GT Spirit GT126"